Now that Sophia is headed back to school, our preparations are in full swing for her next level of adulthood: living on her own in an apartment. When she lived in the dorms, she managed her world nicely. Except for the rib fracture she sustained in the spring necessitating my assistance, she handled all disability and non-disability related issues without help. Class, studying, getting meals, doing laundry and socializing were all easy. And that’s anyone really has to deal with when you live in the dorm. She was pretty much like everyone else. But living in an apartment, she will have to start cooking for herself. That’s a whole different kettle of fish. 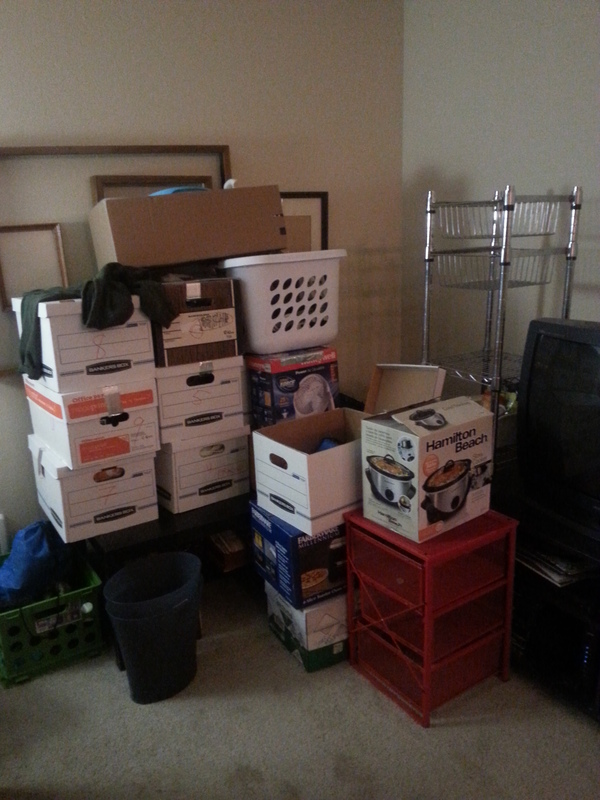 We’re pretty much finished acquiring the items she will need for the apartment. She’ll be rooming with three other students, and they’ve divided up everything they’ll need to buy and each person is responsible for a chunk of it, so she’s not bringing pots and pans, but she is bringing the toaster. My mom brain goes into hyperdrive considering all the different issues that might crop up. What if the pans the roommate brings are too heavy for her to use? What if the handles aren’t easy for her to grip? I see pans at the store that would work perfectly for her, but pans aren’t our deal, so I don’t get pans. But I fret. What we have done, however, is purchase her assigned items with her specific needs in mind. I mean, every parent does that, but when a person has OI, the needs are different. Reach can be limited, as can strength. Because she’s so short, her face is at risk for being burned whenever she goes near a pot on the stove. She won’t be cooking bacon on the stove anyway. I taught her to bake it in the oven. To limit her risk, we found some excellent choices. She will have a small crock pot to use for some meals I am freezing for her to take with her so her first couple of weeks will be a little easier. No splash-face-cooking for a little while, anyway. And Tim found her a toaster oven instead of a toaster, since the front-access will be so much easier and safer for her than a top-access appliance. We found both of these new in the box on Craigslist for a fraction of what they cost new. She’s taking along a couple of sets of small tongs as well, which she homed in on as a great accessibility tool. She’ll just leave them in places that she can’t typically reach. As long as they don’t drop down behind something (like utensils like to do), that will work great. She’s got detergent pods for doing laundry, a wonderful tool that worked really well for her when she lived in the dorms. Is it the best laundry soap out there? No. Does it use more chemicals than I would like my daughter to be exposed to? Yes. I’d prefer everyone in our family use homemade laundry soap. But is it the tool that will give her the most independence? Absolutely. And that’s where I draw my line. We haven’t yet gone as far as getting her an electric jar opener, though I am thinking about it. Her hands are smallish, but she has gained a lot of strength in the last few years. She probably doesn’t need it. She’s got a (really cute!) little chef’s knife and a small serrated knife for bread and tomatoes. She’ll have those flexible cutting boards. She probably won’t ever cut onions, because there’s no way to make the onion far enough from her face to keep her from being blinded by tears. I’m still figuring out the oven mitts situation, because typical ones are so huge they will dangerously interfere with her ability to grip anything. I never worried about the boys’ first apartment setups on this level. Matt was a nerd about kitchen stuff, so he took care of it on his own. Thomas’ food choices have always been what we call “food based on a dare”, so my expectations for kitchen equipment don’t align with his needs anyway. But Sophia is really interested in cooking for herself, and making the dishes she grew up with, so I’m trying to get her set up to cook my food in her adapted world. The basic stuff, anyway. No need to jump into Meg’s Wonderful World of Baked Goods in the first go. She’s going back to school. She’s moving into the nuts and bolts of adulthood, the “how do I take care of myself on a day-to-day basis?” stuff that can be so overwhelming when you first start out. It’s exciting, to be sure. I remember being so stoked to finally get to choose my own cereal. It’s still one of my top three favorite things about adulthood, even though I don’t eat cereal much anymore. But the idea of deciding for yourself what you want your world to look like, to taste and smell like, that’s a powerful moment in life. And she’s starting into that realm. She’s leveling up into advanced young-adulthood, into her last burst of her educational career, into the time when she defines the direction of her adulthood. Right now, all those thoughts about her future have been combined, organized into categories, packed into small boxes. Hell, we even had to think through the kind of boxes she could use, and how much could be packed into each box according to how much weight she can handle on her own. We labeled and cataloged the boxes so she won’t have to pull down every single one to find that one thing she was looking for. If she had to do that, she’d never find her way out of the sea of belongings. I am hopeful she’ll be able to manage the unpacking process all on her own. That’s how I’ve designed it, anyway. And that’s pretty much the last of my involvement in her next step. After this, after we install her in the apartment with her roommates, she’s on her own. She has to figure out how to take it from there. We gave her the tools, now it’s on her. Just like it is on each of us when we move out on our own. I won’t ever be very far away, just a phone call and a two hour drive, and I will, of course, be there when she needs me. But she’s not the kid who will be calling for my help, which is why I’m pushing the plan-ahead factor so hard right now. She’s too independent to call for her Mama unless it’s absolutely necessary. And I’m trying to make it so it’s never absolutely necessary. In a week, we fly to Chicago for a wedding. The weekend after that, she goes back to school. She’s pretty excited. I think I am too. The true moment of adulthood is when you have to fish your own toothbrush out of the toilet. I am so excited for this adventure!